Employees had been designing their own email signatures, with no two looking the same. Important legal details were not being included and some of the signatures were of a low standard. Exclaimer Signature Manager Exchange Edition allowed for the creation of a uniform email signature that was centrally managed through Exchange, allowing every employee to conform to brand guidelines and EU legislation. Plambeck Baustoffcentrum is a prestigious, family-run, home improvement organization based in Germany with roots dating back more than a century. The founder, Hinrich Plambeck, started his first business in 1903, which became Plambeck Baustoffcentrum ten years later. Many members of the Plambeck family played a direct part in the organization’s success and allowed it to build a strong reputation within the German corporate sphere. It later expanded into real estate in 1963, where it became known for providing innovative and expert construction advice to the citizens of the metropolitan region of Hamburg. Today, Plambeck Baustoffcentrum consists of four building material centers in Hamburg and a hardware store, Otto Meyer Hardware, in Norderstedt. It continues to go from strength to strength even after being in business for than 100 years and shows no signs of slowing down. 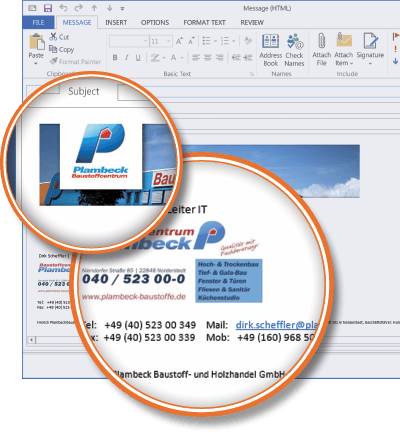 Upon an internal audit, it was discovered there were some serious issues with Plambeck Baustoffcentrum’s corporate email signatures. Every user had been designing their own signature, which were often not in keeping with specified brand guidelines. It was clear that not all of its employees were design-oriented, as some of the signatures were poorly made and did not convey the professional image that the organization consistently strives to maintain. Many of these signatures were also missing important legal disclaimers. Under the EU Directive 2003/58/EC, which applies to all members of the European Union, business emails must include a company’s registration number, place of registration and its registered office address. In Germany, the legislation also requires the inclusion of a court register and the name of the managing director/s. With employees not adding these legally required pieces of information, Plambeck Baustoffcentrum was at risk of receiving fines of up to €5,000. As Head of IT, Dirk Scheffler decided to look for a software solution that would keep the cost of email signature uniformity as low as possible, but be flexible enough to deal with future possibilities. The installation of the software was so easy that we were able to provide brand new email signatures to all employees very quickly. Having worked for another organization previously, Mr Scheffler had used Exclaimer email signature software before. This had been a positive experience for him, so it was only natural that he would choose to purchase Exclaimer software for Plambeck Baustoffcentrum. Looking at the various options available, he decided to purchase Signature Manager Exchange Edition. The main reasoning was that he preferred all email signatures to be processed through the Exchange server, meaning no employee could modify them in any way. As the purpose of this project was to stop poorly branded and non-compliant email signatures being sent outside of the organization, this made perfect sense. As an organization that has a distinguished history and a proud heritage to maintain, the Plambeck Baustoffcentrum brand is important to its reputation. Previous employee email signatures had put this at risk, so by creating one unified signature that everyone would use, Signature Manager Exchange Edition rectified a problem that could have had serious consequences in the future. The IT department can easily make changes to the signature when needed and deploy new ones in the future, safe in the knowledge that no end user can tamper with them.